'Tis the season, no not the festive holiday season, but the entertainment industry's winter awards season. 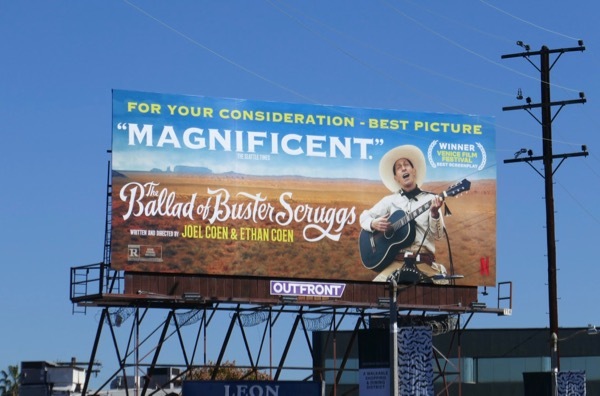 Here's a collection of the 'For your consideration' billboards filling L.A.'s skies courtesy of streaming giant Netflix this month. 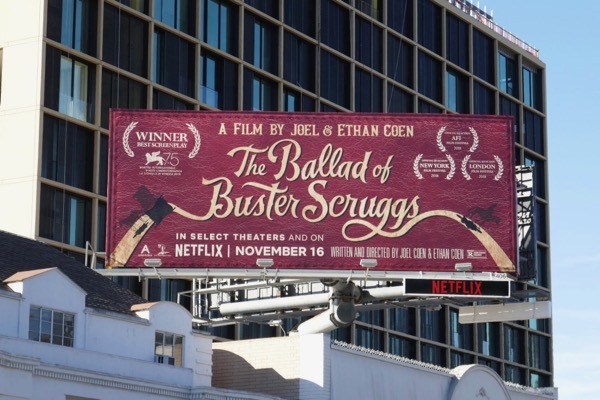 First up is some outdoor support for The Ballad of Buster Scruggs, the new comedy anthology film by Joel and Ethan Coen featuring six stories set in the Old West. 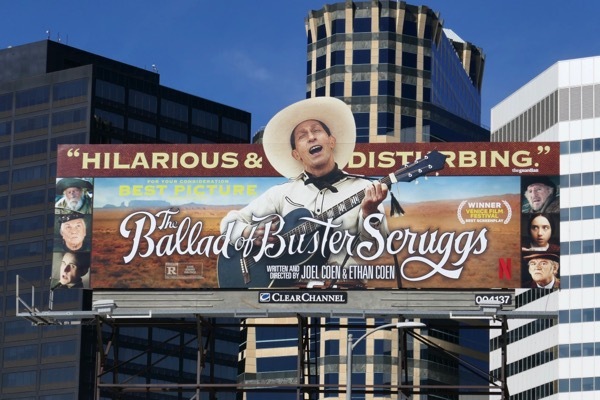 The new movie stars the likes of Tim Blake Nelson as the titular singing gunslinger 'Buster Scruggs', Zoe Kazan, Tyne Daly, Clancy Brown, Liam Neeson, Tom Waits, James Franco, Brendan Gleeson and more besides. 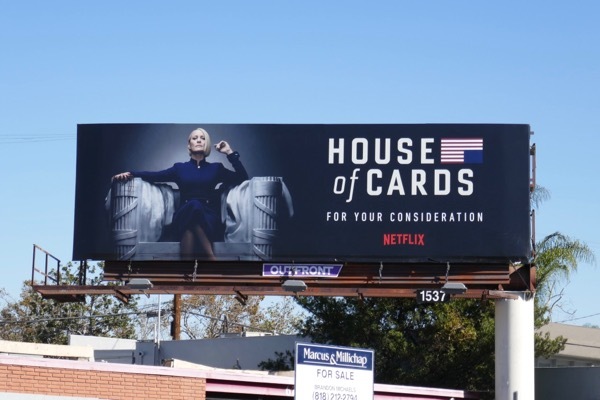 These standard billboards for the Netflix film were snapped along Sunset Boulevard from November 2 to November 16, whilst the FYC special extension cut-out billboards were photographed above Westwood Boulevard and Ventura Boulevard from November 27 to December 1, 2018. 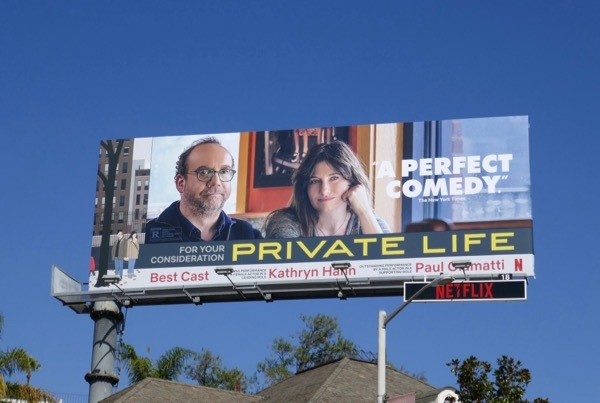 Another movie offering from the streaming service hoping for your consideration this season is Private Life written and directed by Tamara Jenkins and starring Kathryn Hahn and Paul Giamatti. The comedy drama is about a couple in their 40s struggling with the economic and emotional toll of fertility treatments to keep their marriage together. 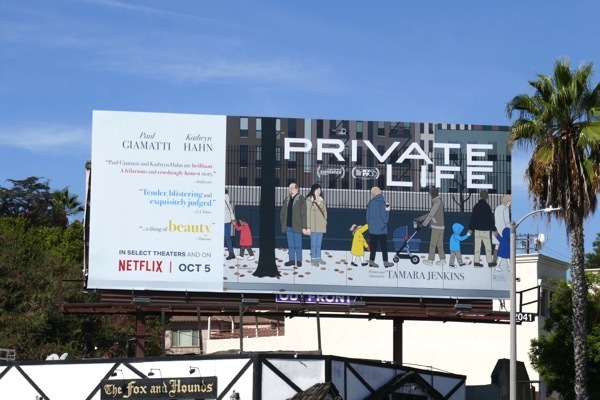 The Private Life movie launch billboard was snapped along Ventura Boulevard on September 27, whilst the 'For your consideration' billboard was spied above the Sunset Strip on November 7, 2018. 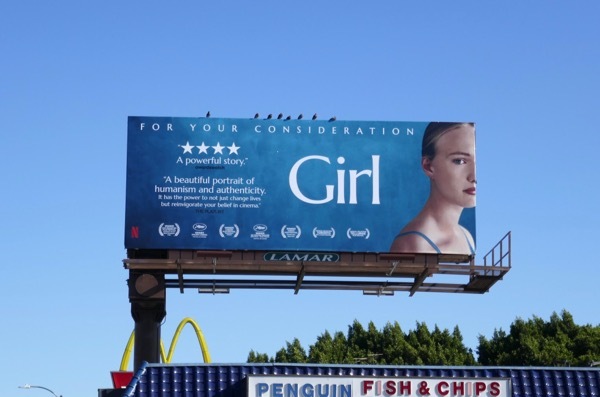 Meanwhile Lukas Dhont's feature film Girl is hoping to receive some recognition for its timely story about a transgender girl, 'Lara' (Victor Polster), committed to becoming a ballerina. 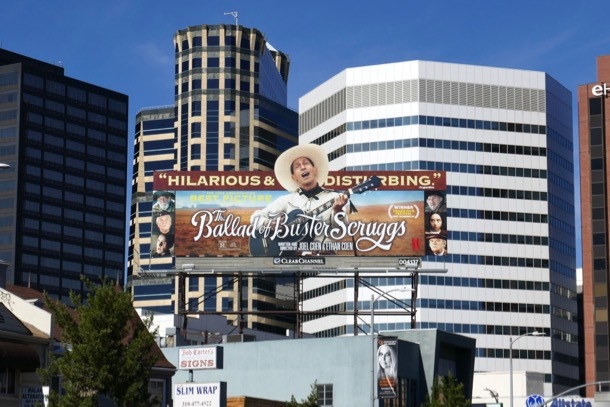 These FYC billboards were spied along the Sunset Strip and Pico Boulevard from November 22 to November 24, 2018. Having not received a Best Picture Oscar nomination to date, Netflix is also hoping that its tragic true story of the mass killing of 77 young people in Norway in 2011 and its aftermath may be in the running this year. 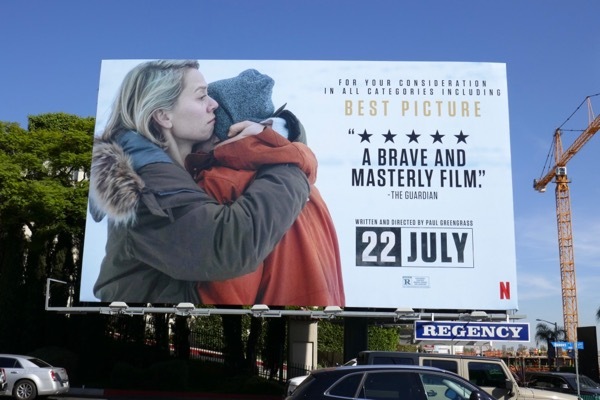 These FYC billboards for the movie directed by Paul Greengrass were snapped along the Sunset Strip and Venice Boulevard from November 1 to November 11, 2018. 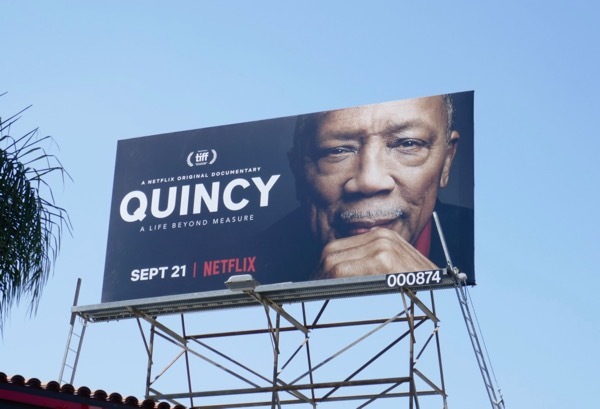 In the world of documentaries, Grammy-winning music mogul Quincy Jones is also in the spotlight this season, co-directed by his daughter Rashida Jones and Alan Hicks. 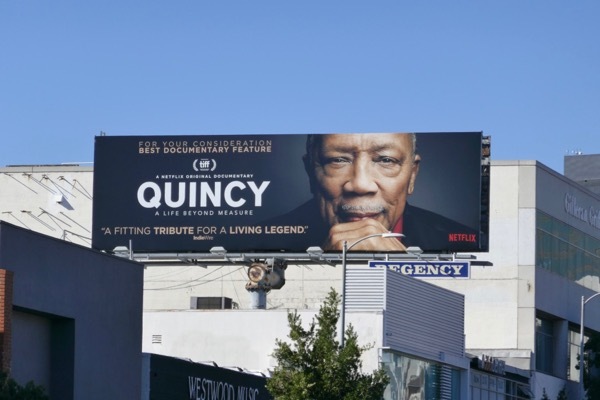 The Quincy documentary release date billboard was snapped above Melrose Avenue on September 19, whilst the FYC version was spotted along Westwood Boulevard on November 27, 2018. Meanwhile Netflix was also supporting its extensive television offering, like its first original scripted drama, House of Cards, which recently came to an end with its sixth and final season with Robin Wright in the political hot seat. 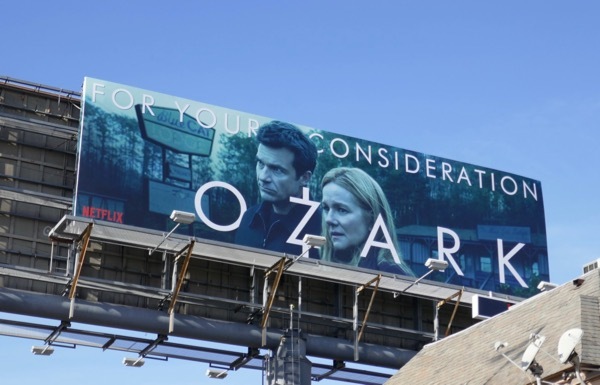 The sophomore season of the money laundering drama Ozark, starring Jason Bateman and Laura Linney, was also up for consideration this month. Cary Joji Fukunaga's limited series Maniac, starring film stars Jonah Hill and Emma Stone, was also being showcased this awards season. 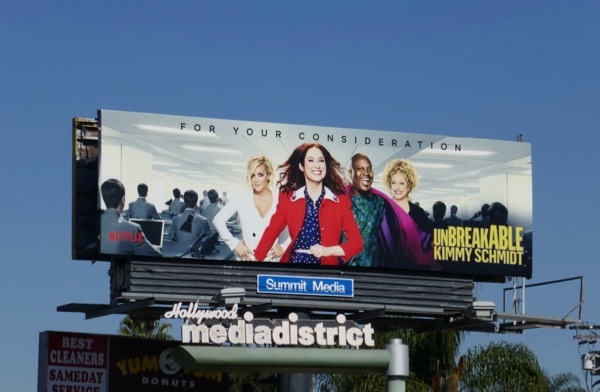 Plus the first half of the fourth season of Ellie Kemper comedy, Unbreakable Kimmy Schmidt, was also hoping for some accolades this year. 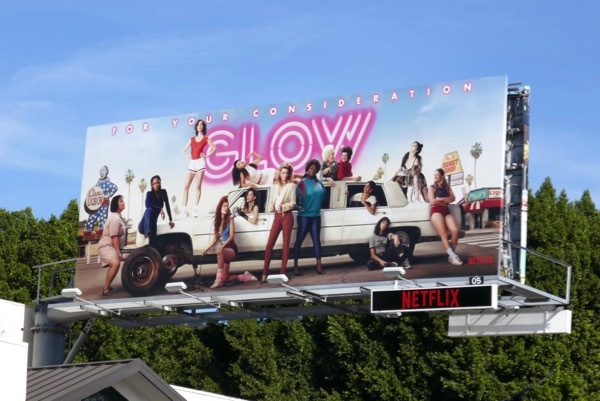 And finally, the second season of Netflix's 1980s female wrestling dramedy, GLOW, was ready to rumble this November. 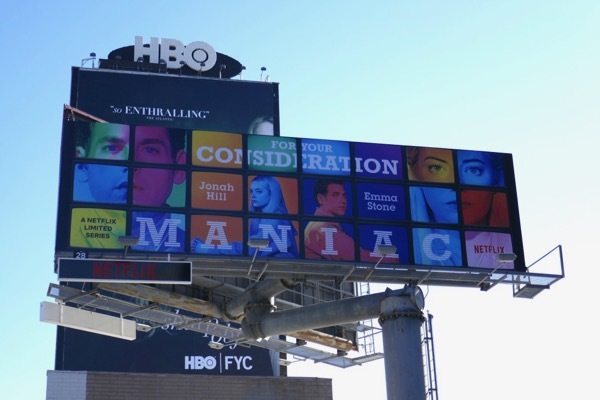 All these television FYC billboards were snapped from November 14 to November 16, 2018, in ad locations along the Sunset Strip, Highland Avenue and Melrose Avenue. 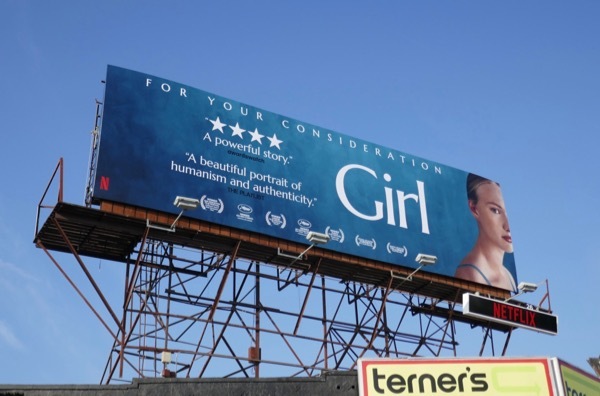 With this year's Golden Globe Awards nominations being announced on December 6 and the Screen Actors Guild Awards nominations announced on December 12, 2018, we'll soon find out if all this out-of-home campaigning has worked its desired magic. 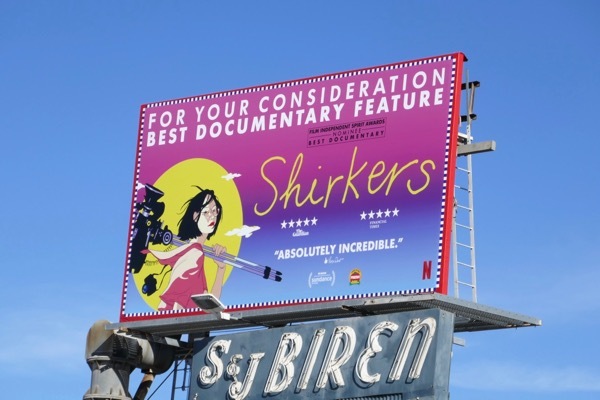 UPDATED: Here's also a colourful FYC billboard for Sandi Tan's Netflix documentary, Shirkers, spotted along the Sunset Strip on December 4, 2018. 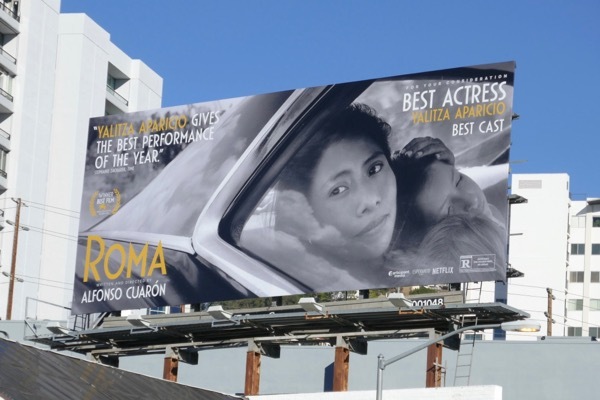 UPDATED: Here's also a For your consideration billboard for Alfonso Cuarón's black and white foreign language movie, Roma, and the actress Yalitza Aparicio and the rest of the cast, spotted above Santa Monica Boulevard on December 7, 2018. 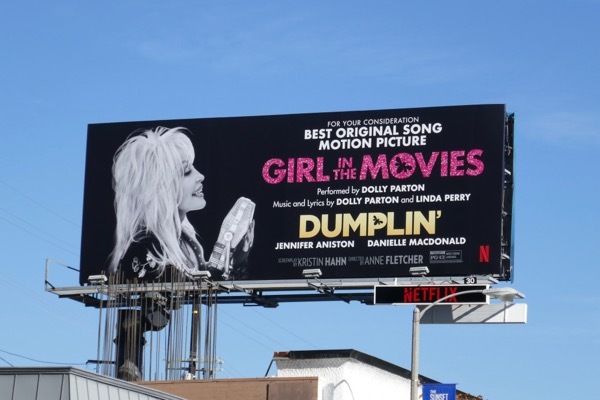 Plus a billboard spotted along Fairfax Avenue on December 7, 2018, for Dolly Parton's new song 'Girl in the movies' featured in the new Netflix film, Dumplin', hoping for some consideration for Best Original Song from a Motion Picture this season. 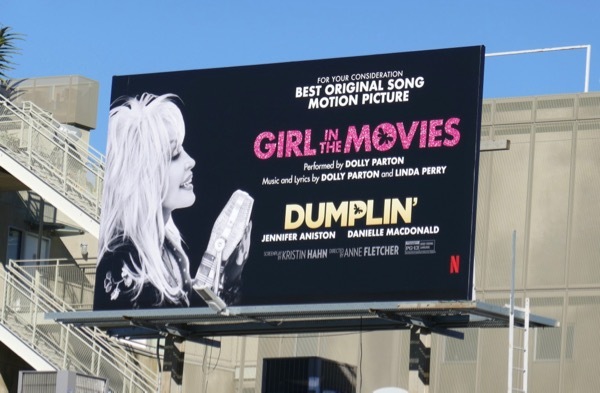 UPDATED: Here's also a larger landscape billboard for Dolly Parton's new track and the movie Dumplin' spotted along the Sunset Strip on December 9, 2018. 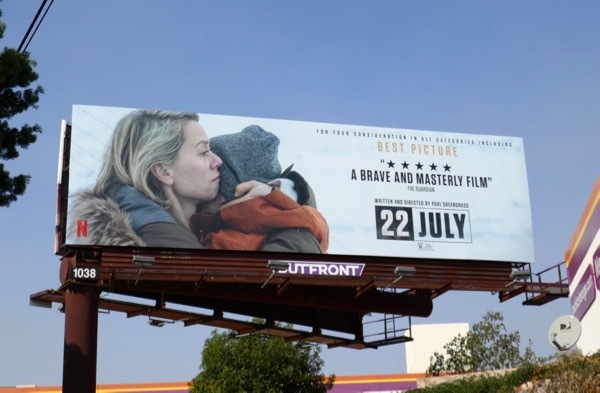 Plus a smaller ad for the documentary Shirkers spied along Pico Boulevard the same day. 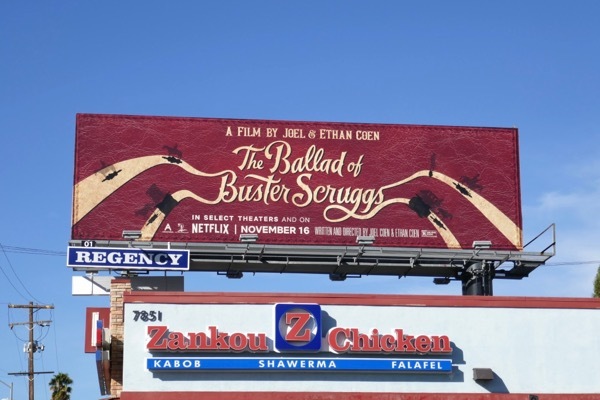 UPDATED: Here's also another FYC billboard for The Ballad of Buster Scruggs spotted along L.A.'s 3rd Street on December 15, 2018. 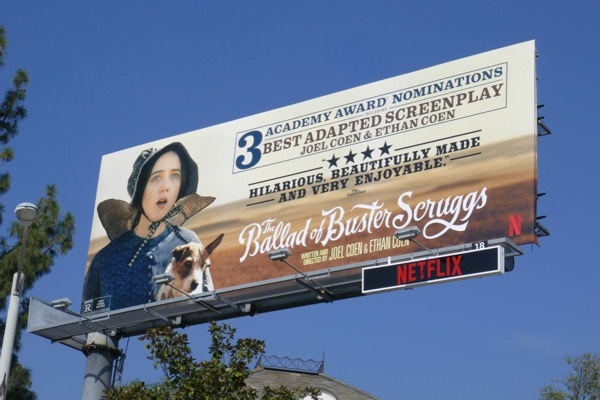 UPDATED: Congratulations to The Ballad of Buster Scruggs for garnering three Oscar nominations, including Best Costume Design for Mary Zophres, Best Adapted Screenplay for the Coen Brothers and Best Original Song for 'When a Cowboy Trades his Spurs for Wings' by David Rawlings and Gillian Welch. 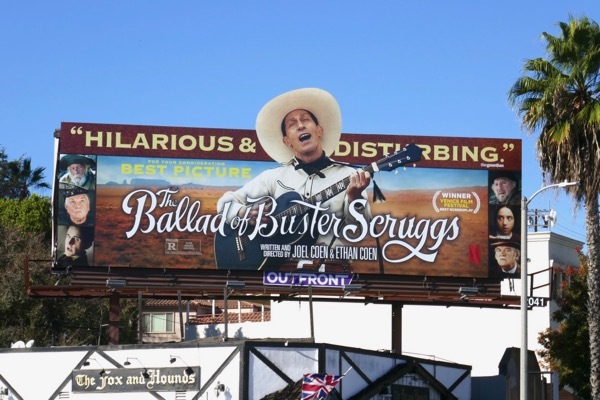 This Oscar nominee billboard was snapped along the Sunset Strip on January 30, 2019.